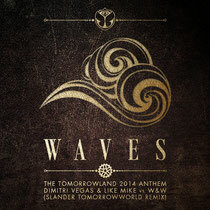 In celebration of TomorrowWorld 2014 this weekend, the festival has enlisted Los Angeles' duo, Slander, for a TomorrowWorld remix of Dimitri Vegas & Like Mike vs. W&W's ‘Waves’, the official Tomorrowland 2014 anthem. After months of promotions, build up and hype, TomorrowWorld is now just a few days away, and Chattahoochee Hills, Georgia will soon be filled with clubbers ready to experience the dance festival. The "Heaven Trap" masterminds, Slander, have been on a tear, and as the final countdown for the festival begins, they revitalise the official Tomorrowland 2014 anthem with their melodic, low end-focused mid-tempo sound.